Thurning post windmill was built on top of and worked in conjunction with Thurning_watermill during the 1800s. From the 1826 auction details it would appear that each the mill was powering two sets of stones. Bryant's map of 1826 shows shows both mills and marks them as Union Mills, which would infer that they were either both powering the same machinery or that they worked as a pair. Originally two brothers built the mill as a windmill and watermill combined - Union Mills but they then argued and fell out. One remained a miller and the other took to farming and he planted all the nearby trees in order to take the wind out of the mill's sails. Thus eventually the miller had to dismantle the windmill. Thurning_watermill was worked as a Union Mill during the 1800s, whereby a small windmill (quite probably but not definitely, a composite postmill) was erected on top of the watermill and the two were run together. From the 1826 auction details it would appear that mill, as a single entity, was powering four sets of stones, possibly two in the watermill building and two in the windmill above although it's also feasible that both could be geared to run independently. 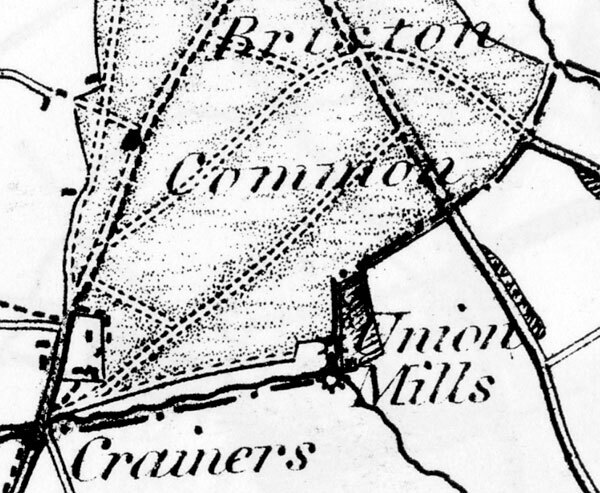 Bryant's map of 1826 shows shows both mills and marks them as Union Mills, which would also infer that they were either both powering the same machinery or that they worked as a pair within the same structure. I was interested in the reference to Thurning Mill (East Anglian Magazine Nov. 1957), as at one time I was working with a man whose father had helped to run it. He told me that there used to be a small windmill on top of the watermill but that, as it was not very satisfactory it was later removed. Commercial - Sexton, John, Miller (wind). Originally two brothers built the mill as a windmill but they then argued and fell out. One remained a miller and the other took to farming and he planted all the nearby trees in order to take the wind out of the mill's sails. Thus eventually the miller had to rebuild the mill as a watermill. It would appear the windmill was erected c.1825 and was removed some time after 1861. Thurning Union mill was of only three mills in Norfolk to use both water and wind power from the same site, the others being Burnham Overy Union and Little_Cressingham . Lot 1. Messuage... in the occupation of Mr. Samuel Johnson, the proprietor. Lot 2. A Water_Corn_Mill & Wind Mill, lately erected on the most improved construction & containing four pairs of stones & two flour dressers, with stable, cowhouse & other outhouses & 27 acres or thereabouts of Arable land, meadow, wood & ozier ground adjoining. Also a Messuage & garden at a short distance from the Mill. The buildings & part of the lands in this Lot are in the occupation of William Reynolds, tenant from year to year & Possession of the remainder may be had at Michaelmas next. Apply to Mr. J. B. Jackson, of Cley near Holt, the Auctioneer at Sherringham or Copeman & Parmeter of Aylsham of whose office Maps of the Property may be inspected. N.B. Purchasers may be accommodated with considerable portions of the purchase monies. Apply to Mr. J. B. Jackson, of Cley near Holt or Copeman & Parmeter of Aylsham of whose office Maps of the Property may be inspected. Also a WATER_CORN_MILL & WINDMILL, lately erected on the most improved construction & containing four pair of Stones, two Flour Dressers, with stable, cowhouse & other outhouses & 27 acres or thereabouts of Arable land, Meadow, Wood & Ozier Ground adjoining. Also a Messuage & Garden at a short distance from the Mill. The Buildings & part of the Lands in this Lot are in the occupation of William Reynolds & possession of the remainder may be had at Michaelmas next. N.B. The above Estates are in Thurning which is in an adjoining parish to Melton Constable (except for about four acres being n Briston) & all the Tenants hold from year to year. Also a Water_Corn_Mill & Windmill, lately erected on the most improved construction & containing four pair of Stones, two Flour Dressers, with Stable, Cow house & other Outbuildings & 27 acres or thereabouts of Arable land, Meadow, Wood & Ozier Ground adjoining. Lot 2. A Water_Corn_Mill & Windmill, lately erected on the most improved construction & containing four pair of stones, two flour dressers, with stable, cow house & other outhouses & 27 acres or thereabouts of Arable land, Meadow, Wood & Ozier Ground adjoining. Also the Messuage & Garden at a short distance from the Mill. N.B. Thew above Lots (1 - 4) are in Thurning which is an adjoining parish to Melton Constable (except about 4 four acres lying in Briston). Wiliam & Robert Reynolds. Thurning, millers. Deed of Assignment 13 October 1856 for benefit of Creditors. Lot 2. A Messuage or Dwelling House with productive Garden adjoining, Watermill driving two pairs of stones, with large waterwheel in good repair & plentiful supply of water, Windmill, Cart Lodge, & other Outbuildings together with 30a. 1r. 19p. of Arable & Pasture LAND adjoining in the occupation of Chester Leman. This lot abuts upon Briston Common & land of James Gay, Esq. The Mills are capable of doing an extensive & lucrative business. The above described property is offered for sale by the directions of the Trustees under the Will of Thomas Armes, decd. Apply to Messrs. Wilkinson & Slann, Solrs. or the Auctioneers, Holt.